The Fusion is also an ideal trial machine because there is less setup. With the first month’s rent applied to any subsequent purchase, a lot of companies try the Fusion first. 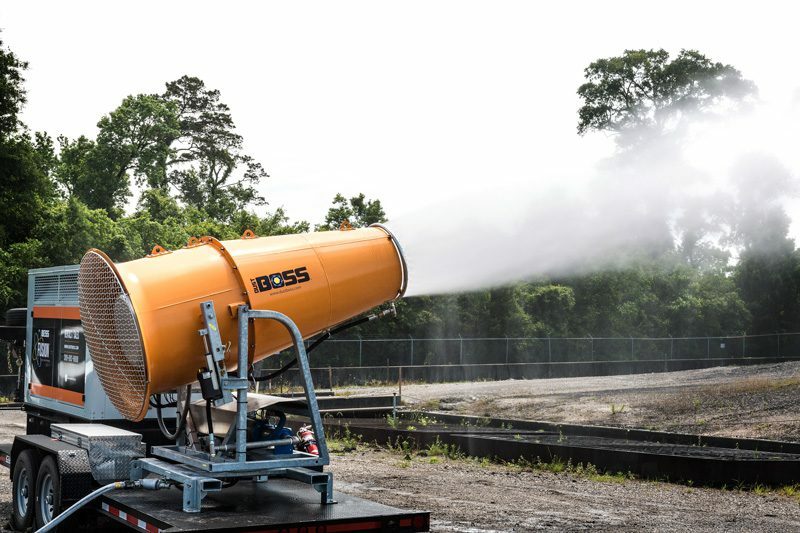 The most powerful DustBoss dust suppression cannon is now available packaged with a genset and mounted on roadworthy trailer. The DustBoss® DB-100 Fusion™ is powered by a 480 V / 150 KW generator with a 6.8 liter John Deere Tier III flex diesel engine, all securely mounted on one of several roadworthy dual-axle trailer options with stabilizing jacks. The DB-100 atomized mist design features a range of 100 meters and the ability to deliver 140,000 square feet (15,500 square meters) of coverage area. The great thing about direct drive electric motors is with less moving parts, they last longer and require less maintenance. That is why DustBoss dust suppression cannons are electric. The downside to electric is that location is dictated by a power cord. Pairing the electric dust cannons with a generator and mounting both on a roadworthy trailer effectively cuts the cord and unlocks more mobility. The most popular DustBoss was the first released in a genset / trailer package. The DB-60 Fusion is proving popular in many industries. The transient nature of the demolition industry, for example, demands dust control in a variety of settings that don’t always have convenient power sources. It didn’t take long for the calls to “unleash” the DB-100 to be heard. 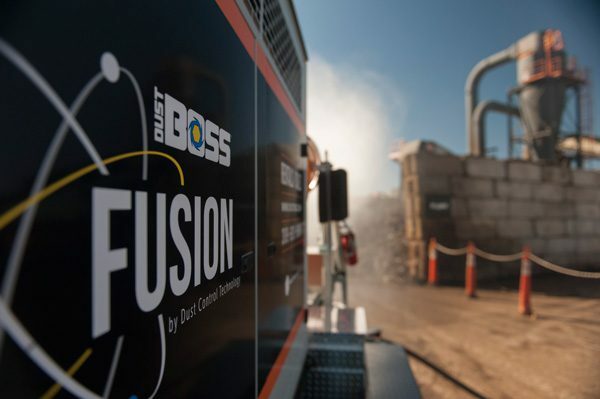 Designed for applications that require extensive dust control, the DB-100 Fusion fits well into the fugitive dust plan of mines, coal handling plants, aggregate operations, and beyond. By providing a mobile power source, the design requires only a water source for operation. The new design can even be specified with a high-lift pump for drawing water from a stationary source, such as a private pond, for a truly self-contained dust suppression solution. DB-100 Fusion features a 150 gallon fuel tank, providing about 32 hours of run time without refueling. A weather protective aluminum enclosure houses the tank and a powerful Basler 2020 deluxe control panel for running the gen set and providing detailed diagnostics. Access doors are equipped with hinges and door stops for easy access, and the generator’s engine compartment is fitted with sound attenuation. Day-to-day operation can typically be managed by the remotely located on/off switch outside of the enclosure. For convenience, a 120 volt receptacle for auxiliary tools and a plug-in for the battery charger and block heater are also located outside. Fire hoses and couplings are supplied and stored in easy-access tool boxes, along with a spare set of nozzles and basic tools. These small details serve the objective to provide everything need for routine operation and maintenance. To achieve its 100-meter throw distance, the DB-100 employs a 60 HP electric fan motor coupled with 10-90 PSI of inlet water pressure that’s run through a booster pump to achieve pressures as high as 250 PSI total. Unlike industrial sprinkler systems used for dust management, which can require as much as 500 GPM (1893 LPM) of water, the DB-100 Fusion uses only about 38 GPM (143.8 LPM) to help avoid pooling or runoff. The unit shatters the inlet stream into millions of tiny droplets in the range of 50-200 microns -- an ideal size for suppressing fugitive dust particles in most cases. The device can also be customized with alternative nozzle options for specialized applications. The DB-100 Fusion features user-defined oscillation, along with adjustable elevation from -7º to 45º. It can also be outfitted with a dosing pump to accurately meter in surfactants or tackifiers to further enhance binding of dust particles. The DB-100 Fusion can be set up to run potable water and can also be outfitted with a selection of filters to handle non-potable water sources. For applications in which the water source contains high amounts of sediment, additional external filters are available. For operation in cold climates, heaters for the enclosure and heat tracing for pipes are available as options, and each machine is equipped with multiple automatic drain valves to enhance freeze protection. Users can easily set a custom oscillation range via the touch screen controls. The unit travels at a rate of 1 degree per second to provide ideal coverage, and the oscillator features a quick-release handle that allows the barrel to be repositioned in seconds, without using any tools. 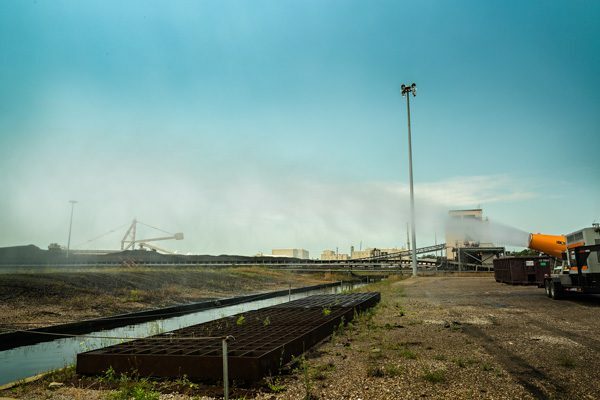 The transient nature of the demolition industry, for example, demands dust control in a variety of settings that don’t always have convenient power sources. Maintenance requirements for the new design are minimal, even though the unit carries a 3-year/3000-hour warranty on the dust suppressor and a 2-year/2000-hour warranty on the gen set. If potable water is being used, nozzles typically need to be inspected just once per year. The turntable bearing on the oscillator should be greased annually or as needed for harsh service conditions and the fan’s motor and high-pressure pump should be lubricated every 10,000 hours. Like any diesel engine, the genset should have regular inspections and changing of oil, coolant and filters. This entry was posted in DB-100, DB-100 Fusion, DustBoss, Fusion, News, Product. Bookmark the permalink. Both comments and trackbacks are currently closed.